Overindulging at the St. Maarten Airport. Missed only one flight. 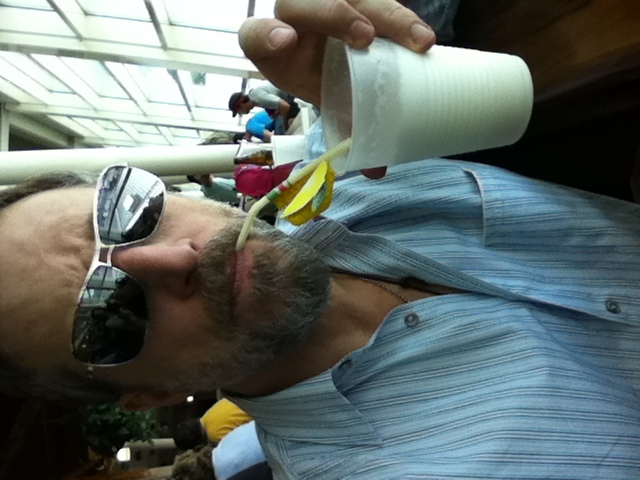 Laszlo samples the local beverages as we forget the time change and miss our flight to St. Barth‘s. What a great start to our sabbatical/vacation. There is a little bakery that offers hotdogs wrapped in delectable pastry. Try them. With mustard. However if you are using Invisiline teeth straighteners, do not store them in your napkin, then promptly throw the napkin away. Those on their way to St. Barth’s don’t take kindly to fellow passengers who are digging frantically through the trash bins next to them. This entry was posted in Laszlo Von Glitz, St. Barthelemy, travel and leisure, Working vacations and tagged airport, Barth, Caribbean, funny, Laszlo, Saint Barthélemy, Sint Maarten by Laszlo Von Glitz. Bookmark the permalink.